The future of tablets in our schools may not be coming from Cupertino. Or even the U.S. Despite the craze around Apple’s iPad, it's only been two years since the device was introduced, and that may not be enough time to separate fad from trend over the long term in education. And while the iPad’s presence – and promotion by the Apple faithful since its launch in 2010 – is hard to ignore, a winning tablet trend hasn’t been clearly established on a global basis. It’s certainly true that tablets are on the upswing in K-12 schools and higher education. There’s no shortage of U.S. numbers to cite. Going beyond statistics of tablet penetration (in one case, most recently, 25% of college students and 17% of college seniors), it’s in the composition of purchases where the data can get interesting. For example, a Harris Interactive/Pearson Foundation survey released in March gave iPads the largest share among college students (at 63%), followed by the Kindle Fire (26%) and the Samsung Galaxy Tab (15%). As U.S. education appears to be moving toward tablets in pockets here and there, other countries’ education officials are embracing them in bulk. Another way to read those figures: It’s roughly a 60/40 split between Apple’s iOS operating system and all flavors of Android devices (“flavors” might be the right word, as Android has named its more recent OS versions Ice Cream Sandwich and Gingerbread). These relative rankings among popular Android tablets in education mirror the broader U.S. consumer market. But the scope of some big decisions made by international government agencies – and the price of non-U.S. devices – could upset the apple cart. Consider India. 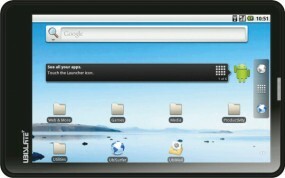 Last fall saw the launch of the highly touted US$50 Aakash Android tablet for education (subsidized to US$35). That initiative subsequently stumbled following reports the first models built by the UK firm DataWind were sluggish and fragile. The government has since decided to press ahead with a new version with improved specifications. Yet the overwhelming interest in what was supposed to be a first run of 100,000 tablets has spurred the growth of a handful of new education-focused competitors. They’ve developed tablets that are more expensive, but apparently more capable: the US$100 ATab, US$150 HCL MeTab, and, perhaps most interesting, the US$125 Funbook – interesting in that manufacturer Micromax’s education content partner for the Funbook is the international educational publishing giant Pearson. All of these relatively inexpensive devices run on Android. 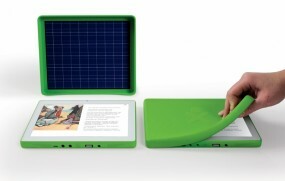 Another international initiative of note: One Laptop Per Child’s XO-3, a projected $100 tablet, due this year, with prototypes shown at January’s Consumer Electronics Show. Designed for students in developing countries, it has OLPC’s now-signature hand crank (for when regular power isn’t available) and it, too, runs on Android (or OLPC’s own Sugar OS). No matter how cheap, having hardware isn’t enough if there isn’t a market. Yet as rapidly as U.S. education appears to be moving toward tablets in a decentralized manner, in pockets here and there, other countries’ education officials are embracing them in bulk. Thailand’s Ministry of Education has announced plans to provide tablets for all of its first-grade students – 900,000 of them. As part of its Digital Education Revolution program, Australia has provided every 9th-through-12th grade student with either a laptop or a tablet this year – and due to purchases of lower-cost tablets, the number of devices actually outnumber students. And though doubts have been expressed about providing tablets for the youngest grades, South Korea is still moving ahead with plans to replace K-12 textbooks with tablets starting in 2014. Regardless of where in the world they're deployed, tablets present key issues that must be dealt with: Settling on appropriate educational content for a full curriculum, whether to attach a keyboard, and the ideal tablet screen size. While many inexpensive tablets are 7 inches, more expensive models such as the iPad are 10 inches – and that’s the minimum size required, for example, for using tablets for the forthcoming Common Core assessments. Plus, of course, there are the traditional concerns that apply to any technology in education, such as teacher training, using the tech effectively for learning, and cost. Considering the speed of tech adoption and growth in the past few years, it's clear that tablets will pervade the education landscape. But it's too early to foretell which devices, or even operating systems, will last or turn out to be fads.